Joy for Beginners is a light read--but I was in the mood for a light read. It centers around a group of women with Kate at the center. Kate is a cancer survivor and her friends have gathered to celebrate her victory over the disease. At this dinner, Kate challenges each of her friends to a task, to overcome one of their personal obstacles. The book then becomes a series of short stories, each one following one of the ladies. The task, in general, are not daunting--learn to bake bread, go on a vacation, etc. But each task pushes their pursuer to grow. The final story is Kate's, as she conquers her own fears on a rafting trip with her daughter. 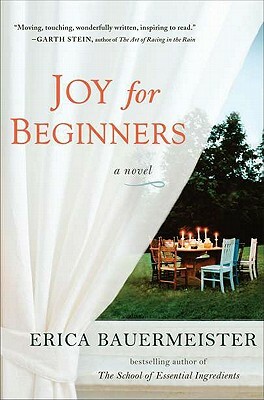 As I said, Joy for Beginners is a light read--but that does not mean it is a fluffy read. These women are so-well crafted that you feel they could live right down the street from you. I will admit that I found it frustrating during the book that I knew so little about Kate, but that was remedied with the last story. Bauermeister's writing is wonderful and sensual. I especially liked her section on Ava, a perfumer with a keen sense of smell. In fact, I sometimes felt that her writing transcended the level of her plot. But, then I just allowed myself to be swept along with the womens' stories. This is the sort of book I would recommend to probably any woman (I can't think of many men who would be able to relate to it). The writing is beautiful, the characters are compelling and it is just a nice, feel good book. Affiliate link: Purchase this item at Amazon. I purchased this book. I was not solicited for this review and I did not receive any compensation.